One of St Johnstone's greatest players is how manager Tommy Wright described Dave MacKay as his captain signed a contract extension until May 2017. 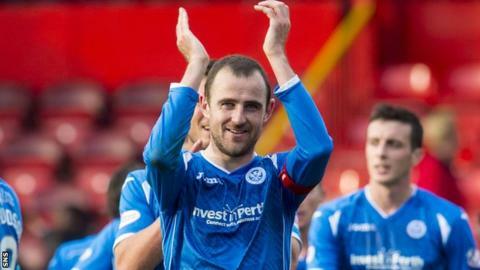 The 35-year-old defender has been at McDiarmid Park since leaving Livingston in 2009. "He has consistently been one of the best players at the club," Wright told his club website. "And, given his length of service, I would argue that he is one the club's best-ever players." MacKay has made 257 appearances for the Scottish Premiership club and was the first St Johnstone captain to lift a major national trophy when Wright's side won the Scottish Cup in 2014. "He's been a captain on and off the pitch," added his manager. "His form since coming back from his summer surgery has been excellent and we were pleased to sit down and get an extension agreed." Rutherglen-born MacKay began his career with Dundee and spent a season with Oxford United before returning to Scotland to join Livingston.